A new update for Power BI just hit your favorite app store! This update includes a number of highly requested improvements and features. Remember, your feedback helps us decide what to implement in the future, so make sure you vote for ideas on our community site and share your thoughts on our mobile forum. After landscape mode was enthusiastically welcomed by iOS users we are happy to announce that it’s also now available on Android and Windows 10 mobile apps. 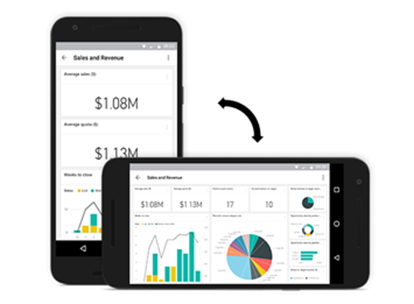 To view your dashboard in landscape mode, simply open the Power BI app and rotate your phone. The dashboard layout will change from a serial list of tiles to a horizontal view that’s very similar to how you see it in your browser on the Power BI service. 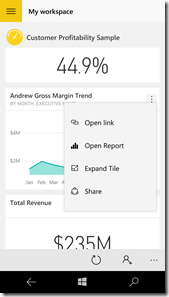 Many of you reached out through the Power BI mobile community and expressed a need not only to view report tiles but also to interact with them. With this update you can tap graph values to cross-filter and highlight other related visualizations on the report tile. We also added a way to easily switch between report tile pages. But wait, there’s more! One of the most requested features has been the ability to consume reports on your phone, and we are rolling this out starting with iPhone and Windows mobile. Interacting with tiles on your Windows 10 mobile dashboard just got faster! 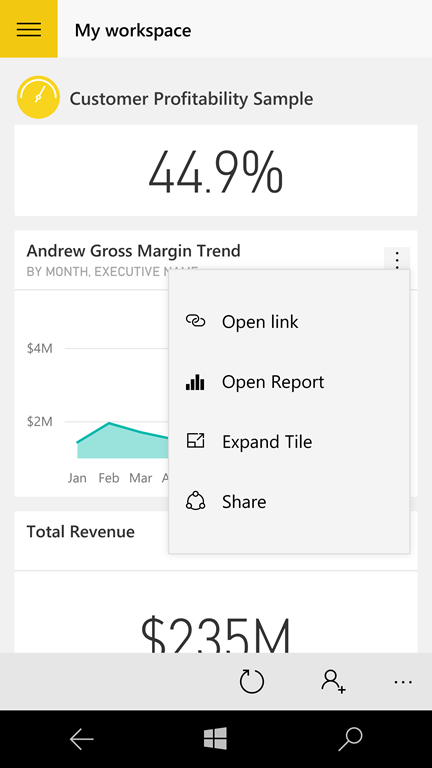 Now you can share a tile snapshot or open a report directly from your dashboard.